I haven’t done much with my Brother KH 800 knitting machine in a while, because having out a delicate machine with fiddly and dangling bits doesn’t seem particularly compatible with having a curious toddler underfoot. And the craft-room door doesn’t actually click closed, so I can’t keep him out of there mid-project. But I’m planning some time off for a mitten-knittin’ marathon, and I am considering bringing out the big guns for it. Thinking of my future knitting machine adventures, I’m probably not going to get around to it soon, but I think a ribber might be a valuable addition to the machine. How do I find out what ribber is compatible? There are a couple of really good sites that I like to refer to that have charts about knitting machine abilities and accessory compatibility. I have used both of these sites to help identify and assess the usefulness of many ebay knitting machine items, and that’s probably how I’m going to find a ribber, if I eventually go for it. My experience is that most of the time when knitting machines and accessories that show up on ebay, the seller found it at an estate sale or grandma’s attic and has no clue what they are selling. If they did a little research, the item is better described and the auction goes well (perhaps too well for my cheap tastes!). If the seller didn’t do their homework, then good deals can be found for the savvy knitting machine shopper. Until next time, keep those needle beds purring! My toddler has been taking up more of my time than my crafts and craft-posting lately. I suppose that’s healthy! But it means few posts here. 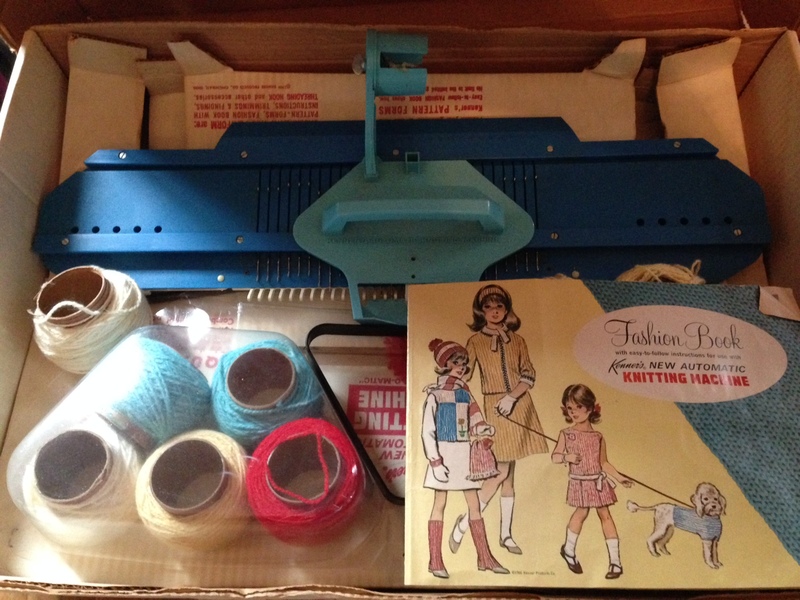 A Kenner 1967ish toy flatbed knitting machine! It boggles my mind to think that there was once a market not only for adult housewives to crank out knitwear on these fun-but-fiddly machines, but also that their children might want to imitate them on kiddie-versions thereof. I seriously wonder if this was a niche-market or considered a mass-market thing. Sometime I’d like to see some stats on yarn-hobby-industry sales over the decades, and find out what portion was hobby machine knitting. 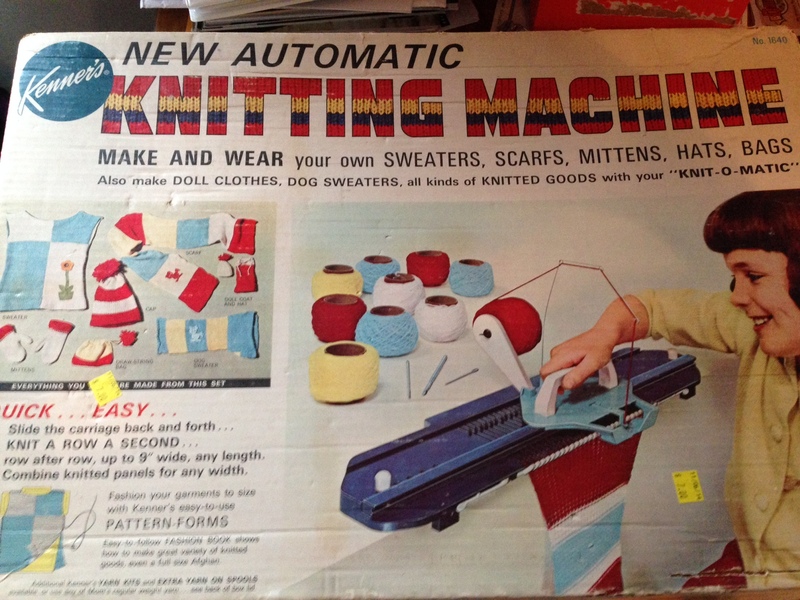 Because it seems like they were making a lot more knitting machine stuff 50 years ago. Trying to look up my $7 Kenner thrift-treasure, I did find some posts on vintage/nostalgia boards talking about the hair-pulling experience of trying to use the toy knitting machine as a child. I’m hoping that my adult-sized knitting machine experiences will make it easier for me to troubleshoot this little machine. It does use standard-sized knitting machine needles, and the manual says it produces a standard gauge (and to borrow Mom’s leftover “regular weight” yarn). But it only has 24 or 28 needles (it’s not in front of me at the moment). It seems to be mostly complete and in decent shape. The carriage bumpers for the two ends are dry-rotted, and the needles on the far ends of the row seem too sticky/tight, but I think I can loosen some screws to help with that. Amazingly, all the needles are there and not a single one is bent or broken! Since most of the original yarn-balls are intact, and there is little evidence of use except for a few remnants of pom-pom cuttings, and some tiny bits of fiber caught in some of the needles, I suspect this toy machine was tried once and given up quickly. I hope I can get it working. I think it might be more convenient than my regular machine to keep out of my baby’s way since it’s so small, and it should be big enough to crank out some mittens if it works ok. Down the road, I am tickled by the thought that my kid might want to try using a knitting machine, and that I’d have a kid-sized one for him to try out. That is, assuming, he has any interest in crafts… I can only hope. Until next time, keep those needle-beds clackety-clacking! My Mom was given a knitting machine by a friend who was cleaning out her basement, it sounded kind of fancy. I offered to teach my Mom how to use it, but our recent get-togethers were focused on other things (eg. I am expecting). When she came over to help me bake traditional Slovak Easter foods for the holiday, I figured I could at least set up my Knitmaster and show her the basics. As I’ve mentioned in previous posts and on the associated info page, my Knitmaster is a very humble sort of knitting machine. It’s a standard gauge (meaning it can handle lace-weight through DK), but it’s functionality is limited to plain stockinette unless you are willing to do some very tedious hand-manipulation. I had considered upgrading to a punch card machine last year, but I really couldn’t justify the expense. My humble Knitmaster was an eBay bargain at $46 including shipping. I’d likely have to pay at least $500 for a gamble on a basic punchcard machine. Spare cash being limited as it often is, I gave up on the idea after a few months of Craigslist and eBay stalking. So last week I showed my Mom the wonders of machine knitting on my Knitmaster. I demonstrated various techniques on a piece that started as an attempt to machine knit a baby cardigan. She also got to try out casting on, binding off, and basic rows. My crafty buddy Emily also stopped by and got to try out the knitting machine. Emily is a scientist by trade, so I think the precision and mechanical nature of the knitting machine were intriguing to her. The next day I got a call from my Mom. Maybe it’s the impending grandma-hood and the baby sweater I was trying to create, maybe it’s the fact that my Mom just won a circular sock knitting machine from ebay, or maybe it was the fact that my machine is kind of simple and her machine was a bit more complex. Whatever the reason, she made me an offer I couldn’t refuse. She asked if I would like to swap knitting machines with her! 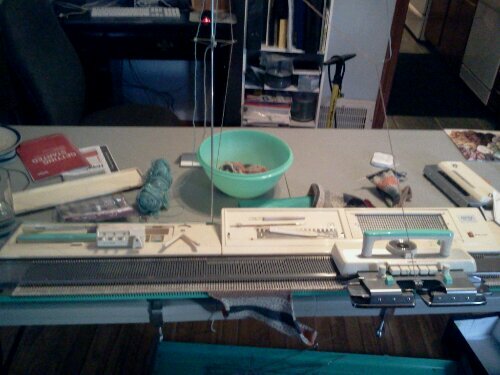 So the pic above is “my” new Brother KH 800 Knitting Machine, “on semi-permanent loan to my collection” as we like to say. So far, I am thrilled! The Brother Knitting Machine had been in a friend of my Mom’s yarn shop, then it was given to another friend of hers who does charity knitting but apparently never got into the knitting machine aspect of production knitting. A basement needed cleaning, the machine went to my Mom, and voila! A free upgrade for me! It is in fairly good shape (a few needles are missing, apparently swapped out and moved to the ends when bent). It has a lace cartridge and takes a 12-stitch punchcard. Alas, the couple of books that I have accumulated on knitting machine patterns are for 24-stitch punchcards, but I think most can be modified. Compared to my Knitmaster, there are a lot of pieces to set up on this machine. Flipping through the PDF manual I found online, I was able to figure out most things. I am slowly building up my abilities with the new functions. I like making hemmed edges on it – the cast on is so easy it feels like cheating! The only major difficulty I am having so far is that the punchcard mechanism is not “reading” the cards correctly. Some of the needles that the card says should be selected are not selecting – I can do it manually, of course, but that sort of defeats the purpose. The PDF manual is missing some pages, but it doesn’t appear that it ever had a page that detailed troubleshooting the punchcard. Hopefully internet research will help, but I may be relegated to taking things apart and seeing what happens. I’m heading for a day-long knitting workshop this weekend with my crafty buddy Emily. A couple of classes and a vendor area… Watch out now – I’m heading into the danger zone!